Key teaching concepts: Discovering rhythm by feeling inner pulse, detail oriented listening, developing technique, motivating students to have music as an essential part of their lives. Book/Methods Used: Alfred’s Basic Piano Library, Hal Leonard’s Basic Guitar Method, FUNdamentals of Drumming for Kids, Stick Control: For the Snare Drummer, On the Beaten Path -Beginning Drumset Course. As a skilled multi-instrumentalist, Luna is accepting new students of all ages on a variety of instruments, including Drums, Guitar, Bass, Piano and Ukulele. Luna has been both a student and performer of music since a young age, playing guitar for over 15 years and drums for over a decade. 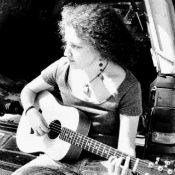 As a student of music in Chile, Luna attended the Valparaiso Samba School, and studied Electric Guitar, Classical Guitar, Drums and Percussion under a variety of private instructors, learning techniques, theory, and advanced chart reading. Lessons with Luna are available in English & Spanish.